Amid the ongoing nationwide protests that have left Brazil’s government scrambling to appease demonstrators’ demands, the country’s legislators are hammering out a new law that will increase the penalties for corruption. 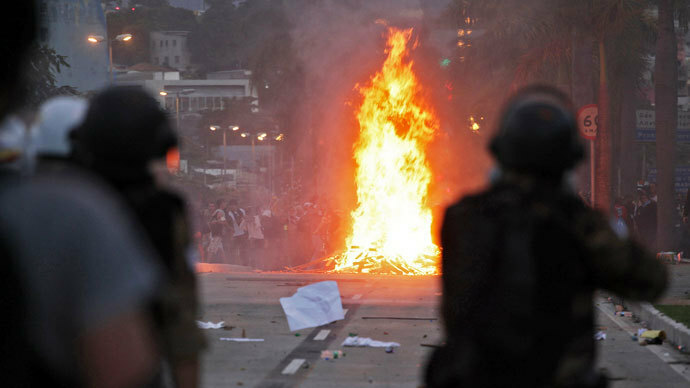 The protest demonstrations, which are targeting rampant corruption, inefficiency of public spending and lack of social protection, continued on Wednesday night in Latin America’s biggest country. Some 40,000 protesters gathered in a march to a stadium in the city of Belo Horizonte during a Brazil-Uruguay Confederations Cup match. The billions of dollars spent on hosting the sporting event is among key points of criticism by the demonstrators. Police responded by firing tear gas as demonstrators attempted to break through barricades, which were erected about 2km around the stadium. Protesters picked up tear gas canisters and lobbed them back at police along with showers of stones and other projectiles. Two protesters were hurt in the confrontation, including a man who fell from an overpass and was critically injured. Earlier about 50,000 earlier gathered at the city’s central plaza. And overnight some masked men shattered the windows of car showroom and set a shop on fire. 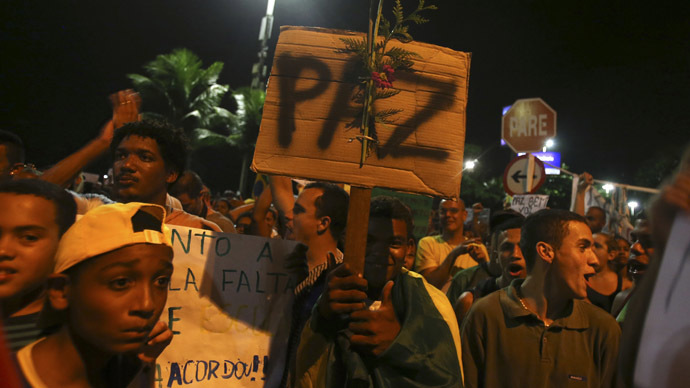 About 2,000 people marched through the northeastern city of Recife. 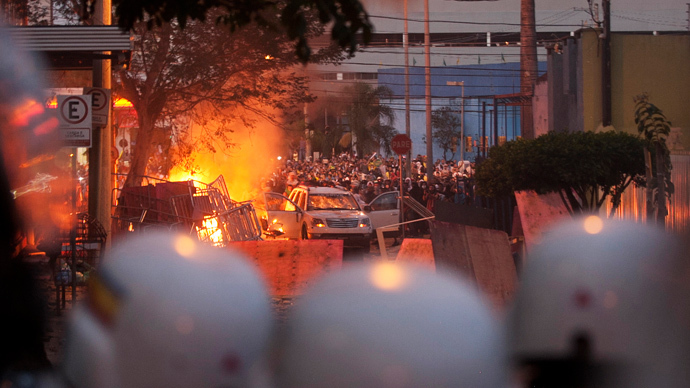 In the capital, Brasilia, demonstrators were seen kicking soccer balls over a police blockade towards congress, in a statement against the billions that have been spent by Brazil in preparation for the Confederations Cup and the 2014 World Cup. In a bid to appease protesters, the lower chamber of Brazilian parliament has fast-tracked measures to stamp out corruption. The legislation, which will still need to be ratified by a second congressional chamber, is expected to sail through and become law. Once enacted, those individuals prosecuted for acts of corruption could face up to 12 years in jail. The bill had not made much headway since its introduction in 2011, but was approved within 48 hours following president Dilma Rousseff’s push for approval. Additional measures to toughen the state’s punishment include the loss of amnesty for those convicted of corruption, and will make obtaining bail and parole more difficult. 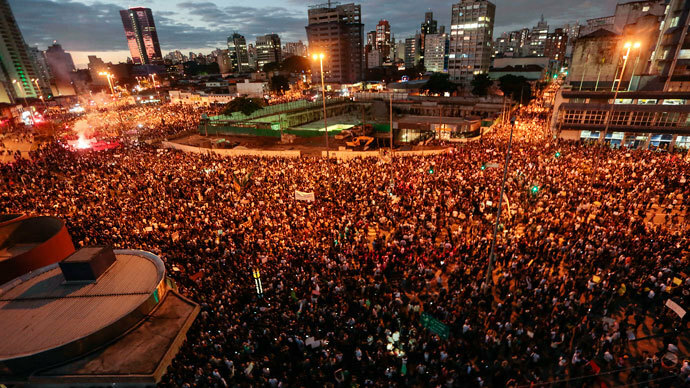 The ongoing protests that have seen well over a million gather in cities across the country were triggered by proposed public transport fare hikes, but quickly grew to encompass a host of complaints, the majority of which revolved around corruption long ingrained in Brazil’s political life. In addition to harsher treatment of corruption, Brazil’s congress has also voted to use all royalties from the country’s recent oil finds - which are expected to yield tens of billions of barrels of crude oil - directly into education and health services. President Rousseff, once a Marxist guerrilla who fought against the country’s former military dictatorship, now finds herself in the unenviable position of listening to protesters’ demands, while avoiding becoming a target herself. On Monday, Rousseff met with state governors and mayors to agree on plans for additional public hospitals, as well as prioritizing public transportation projects. On the agenda was also the congressional action to use all royalties from new oil fields for public services. 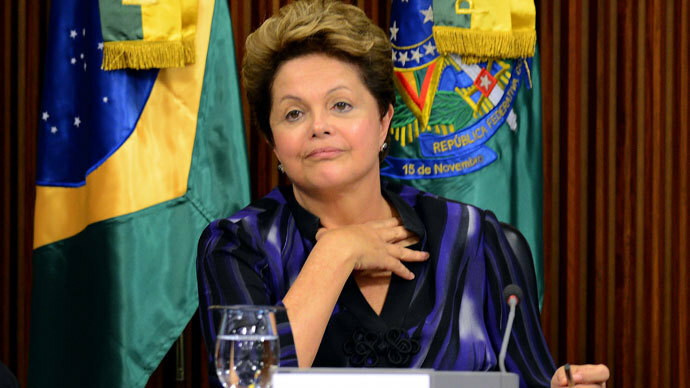 The Brazilian leader also proposed on Monday a plan to hold a public referendum to directly enact political reforms. The move was lauded as a bold plan, and likely an attempt by a popular president to bypass the country's unpopular Congress with a direct appeal to the people. Brazil’s legal experts, however, said that was unconstitutional. According to Reuters, the president of Brazil's Supreme Court, Joaquim Barbosa, weighed into that issue after meeting with Rousseff. "Proposals have been sitting for years in Congress, which has shown no interest in reforming the political system. And that lack of interest, in part, has led to the crisis of legitimacy we have now," said Barbosa. Beyond the president’s initiatives, the president of Brazil’s senate, Renan Calheiros, has also proposed free transport for all students, in an apparent attempt to reach out to the Free Fare Movement, a key organizer in the mass protests that erupted several weeks ago.